There are days when the words fall softly down upon me like a slow, sweaty rain on a warm summer day. And then there are days where the words beat and torment, yielding pellets of stinging splatters that refuse to land in one puddle, deflecting linear thought completely. This was a soft day, and the words were a balm to the year’s wounds, where effort was relaxed and the pen enjoyed the rhythm. I wrote one complete short story and three poems today. I am sharing one of those with you now. How do you describe your writing days? Does your writing come on gentle breezes or on gusts of tormenting winds? This post is a bit of a mish-mash of thoughts. First, thank you all for reading this little bit of me. My blog is a personal reflection of the things in my head, the characters that speak to me, and the visions I have of a fictitious world that I enjoy sharing with you. I appreciate every moment of time you spend here. When I started this journey, I was a little nervous about putting work into the blogosphere, putting myself out there to be critiqued and judged. When I was Freshly Pressed for the post, “Mood Music,” I was blown away by the responses and number of views. It was exciting and humbling. I’ve found in blogging a very supportive community and I am so very thankful I took the chance and I am so thankful for each of you. One of my goals was to publish a book by the end of this year. I’m so thrilled I’ve achieved that goal with the 5-star reviewed, “Marked: Collected Ramblings.” I am very excited to be working on new projects, one of them being a book of flash fiction based on black and white photographs my mother has taken. Her photographs will be included in the book. To see examples of her work, please visit Linda Segerson Photography. Another project is a book of poetry and another book of short stories/flash fiction. I also have a novel in mind – very scary project for me. The novel is absolutely intimidating to me, and if this one comes together as I envision, it may possibly work into a trilogy – very, very daunting for me to even think about, but I’ve already started some free writing and research for it. I’m not putting too much pressure on myself for this particular project, though, because I know me – I know that I don’t outline, which seems would automatically make the task more challenging. Plus, I must really ‘feel’ the writing, love the story and enjoy the work or I won’t finish it. If all those things come together, well then book magic may ensue. One realization I’ve come to is that I can be brave in my writing and I will be. My editor, Scott Morgan of Write Hook says to “write for the jugular” and that’s what I intend to do. I won’t hold back, and I will be authentic for both the characters and the story. I will not fear criticism, she says, clearly determined to make herself believe. As I see it, 2013 is full of promise and possibility – why not dream big and plan big? I wish for you all a happy new year and that you all pursue your dreams to the fullest. So, want to share some of yours for the new year? Any big plans, writing or otherwise? I would love to hear all about it! This one is for you, M.G. Edwards. Merry Christmas! Could I find no joy to write of here at Christmastime? Shouldn’t it feel like winter here at Christmastime? Does my soul have a hope of healing here at Christmastime? What if the miracle I’m looking for is mine? Is it too much to hope for here at Christmastime? How does one give a name to something so horrific? I will feel it and it will sit with me. Read any good books lately? I have. I’ve been reading Anais Nin’s “Under a Glass Bell,” a collection of short stories. I love her writing. I would hate to think I couldn’t read her stories, or those of Dorothy Parker, or those of Hemingway or any other author I enjoy. 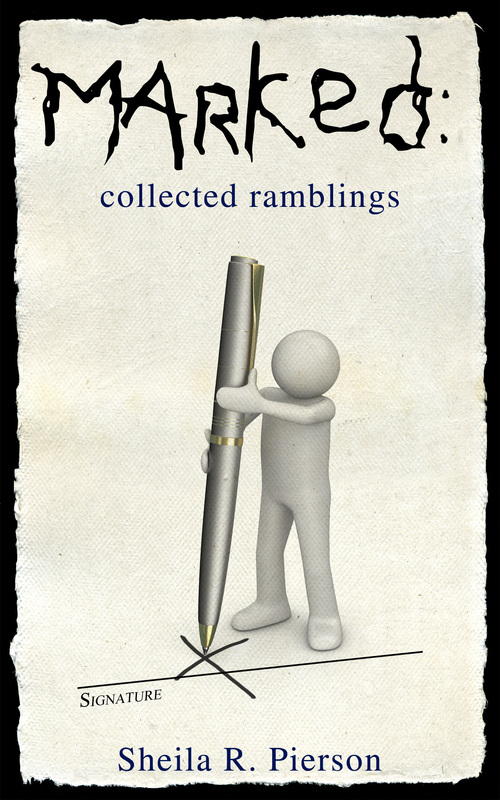 I’d hate to think I couldn’t write my own, as in my new book, “Marked: Collected Ramblings” which is now available on both Smashwords and Amazon.com as an ebook. The truth is a great many teens and adults cannot read the writings of the authors I mentioned above. They can barely write their names or read simple directions. They may suffer self-esteem issues, have depression and typically have difficulty getting or keeping employment. Their entire lives can change if only they could read. Check out these scary stats I discovered at a site called DoSomething.org. It’s okay, I’ll wait while you take a look. I’ve taught two people to read – an adult who could only write his name and my oldest son, whom I homeschooled for a while and taught to read. The adult I worked with was one of those people who simply fell through the cracks in school. He suffered a terrible injury to his right arm while in the first grade, causing him to miss a lot of school and fall behind. Instead of holding him back, he was allowed to proceed through the grades, although he was not proficient in reading. He finally dropped out of school. He worked but was unable to advance from the minimum wage job he’d held for many years due to his illiteracy. He was stuck in that job, plus he was a single parent. I admired so much his courage for coming forth and saying he wanted to read. I admired his dedication to learning. He did progress, began to read and was able to move into a different job that paid better. It was humbling for me and so very rewarding to see his confidence grow as his reading improved. Literacy changes lives. Check with your adult education center in your community if you are interested in learning more about how to teach an adult to read. I went through a training program that taught me everything I needed to be able to teach, and workbooks were provided for my student.